The Westin New York at Times Square stands at the heart of a vivid action-packed metropolis. From thrilling sights to gourmet restaurants to Broadway's glittering star-studded performances, New York delivers something unforgettable for everyone.Whether you are ready for invigorating exercise in the WestinWORKOUT Fitness Studio, a journey with our run concierge, or replenishment in Foundry Kitchen, you will find many thoughtful opportunities to recharge and renew during your stay.After an energetic day about town, allow the soothing ambience of your hotel room to envelop you in restorative comfort. Slip into a cozy terry cloth robe, plug your iPod into the provided speakers, and sink back into the bliss of our Heavenly Bed. What could be more synonymous with the electrifying energy of New York than Times Square? Home to smash Broadway hits, ticker tape parades, larger-than-life electronic billboards and the famous New Year's Eve ball drop, Times Square captures the heartbeat of this vibrant cosmopolitan city. Enjoying a remarkable rennaissance since 2000, the 22 landmark theaters on the Great White Way have been restored to former glory, museums like Madame Tussaud's have opened their doors, new star-studded dining options can be found on Restaurant Row, and the shopping and entertainment possibilities are simply endless. 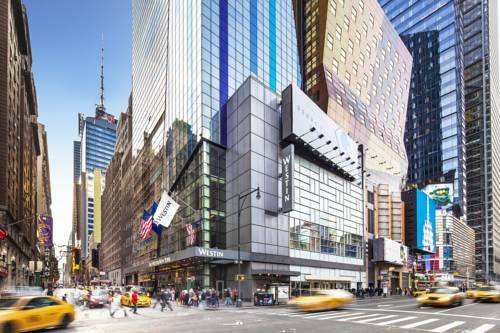 The Westin New York at Times Squares enjoys a neighborhood proximity to all of these sights and sounds, while convenient public transportation options can whisk you north to Central Park and the surrounding Metropolitan Museum, Guggenheim Museum, or the Natural History Museum, to name just a few. Or head south to the charming cobblestoned streets of Greenwich Village, the vivid art galleries of West Chelsea or the deluxe boutiques in the reinvented Meatpacking District. Much closer to home, guests can explore all 200,000 square feet of the E Walk entertainment/retail complex, directly connected to the hotel via the lobby. Here you can enjoy shopping, dining, 13 Regal movie theatres, the New Amsterdam Theatre, ESPN Zone, ABC, MTV---and so much more! For the avid sports fan, Madison Square Garden---home to the New York Knicks, New York Liberty and the New York Rangers---is just a few minutes walk away, while Meadowlands Stadium is easily reached with direct bus service from Port Authority. Also ideal for conference and tradeshow participants, The Westin New York is the closest full-service luxury hotel to the Jacob Javits Convention Center. Located on the lobby level, the new Foundry Bar offers creative cocktails and signature fare in a contemporary setting overlooking Eighth Avenue. Stop by for a quick, convenient bite, or take your time with a hearty meal. Our new mezzanine-level restaurant, Foundry Kitchen, offers buffet-style breakfast, from hearty eggs to deep-dish pancakes.